Short blurb to let everyone know that tonight I will be having some photos in a wonderful gallery show in Bucktown. 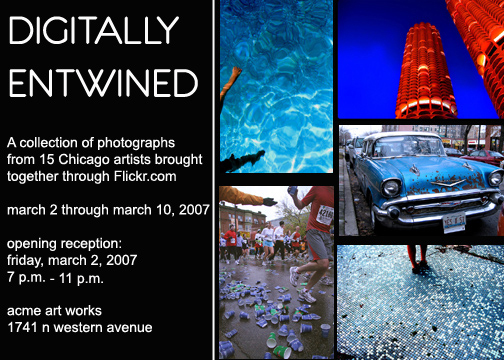 “Digitally Entwined” will feature the work of 15 photographers from Flickr.com. It’s quite neat with lots of lovely photos. If you are in Chicago, you ought to come. Free food, drinks, music, and of course, great photographs.